I'd posted earlier that all of the Walker girls are visiting with us for what is now nearly three weeks. While they got along well for about 10 days, Madison (15) and Reese (13) are now at odds with each other - a common occurrence when they lived together and between siblings in general. I had a brief discussion with each of them about sibling relationships then decided to send them a short story to think about - if not now, perhaps will have a positive impact someday. Thought I'd share it with you as well. "There was once a five year old boy who was an only child and the apple of his parents and next door grandparents eyes, when along came a baby sister. Whether it was the age difference or jealousy from the boy at losing his favored only child status, he and his sister didn’t have a lot to do with one another while growing up. Eventually the boy went off to build his life several hundred miles away, with a job and a family and the girl did the same but in the hometown. As a result the boy and girl would see each other every year or so when the boy returned to visit with the parents. The years passed and the boy and girl continued to see each other during these parental visits and their relationship could best be described as they were good acquaintances - they were never really friends. 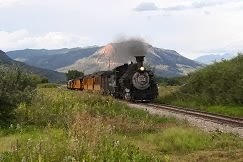 When the boy was nearly 50, he realized that it might not be long before they were the only family members remaining and the he decided to reach out to the girl and she turned out to be receptive. They had many long talks about their childhood, their lives, and their feelings for each other – the girl never liked the boy (he could be a jerk). After a year or so of visits and phone calls the relationship continued to develop, they both liked what was happening between them, and both regretted the lost years they could have had together. Then disaster struck as the girl was diagnosed with stage four cancer. While the relationship was still good, it was hard to build much as the girl spent most of her time battling the disease, they lived 600 miles apart, and both had jobs. The girl fought the disease for five years and the boy spent as much time with her as possible even moving her to his home for a few months at one point. After the five years, the girl was about to lose the battle and as the boy was lamenting the lost time with her, the girl replied “no regrets big brother, these last few years have been great between us.” After this and the loss of their mother with things left undone and words left unsaid, the boy decided he would never again lose a person important to him without keeping any relationship junk cleaned up at all times. I am that boy and the entire family is gone but me. Oh the things I wish I could have redone." During the grandkids visit, Reese requested spaghetti with meat sauce and Bev wanted to add some Italian sausage and meatballs so I went to Velva’s recipe for Sunday Sauce at Tomatoes On The Vine. I have to say this is the most unique sauce I’ve ever seen and considering the meat she used, at some point this ole BBQer will have to try it as she makes it. – please click on the link to have a look at the original. I generally used Velva's ingredients for the sauce and changed up the meat and the cooking process a little. 1. Add hamburger to a large pot and brown over medium heat. 2. When meat is mostly browned, add onion, shallots, and garlic and cook until they are softened, stirring often. 3. Deglaze the pan with some of the tomato liquid scrapping up all of the brown bits (a little red wine could also be used for this). 4. Stir in the tomatoes, dried basil, dried oregano, red pepper, 10 fresh basil leaves, Parmesan rind, and the S&P, bring to a boil then reduce heat and simmer fora couple of hours, if time permits. 5. About 30 minutes before serving, add the meatballs to warm up (we used some we had in the freezer) and grill. Grill the sausage , cut into desired lengths and add to the sauce. 6. Just prior to serving, stir in the remaining basil, then serve pasta per your favorite method – we plated the pasta, topped with meat sauce, added the desired meatballs and sausage, and grated parmesan over everything. Notes: We added the tomato paste as we didn’t have time to cook it long enough to thicken. For pasta we used a mixture of spaghetti and linguini as that’s what we had on hand, but use your favorite. Bev and I both decided this will be our new go-to meat sauce. Thanks Velva for helping with a delicious meal and now I need to invite some friends over and make the original. As I mentioned in the post about camping in North Georgia, we had Madison and her two sisters with us and after the trip they all came back home with us for another week, which got extended to two+ weeks. While here Bev asked each of them if they would like something special for supper and Riley chose chicken noodle soup. For this soup, we’ve been using my dad’s recipe for years and Bev went about making it with the first step being “In a large pot, cover breast with water, add a little salt, bring to boil and simmer until chicken is done – about 25 minutes.” However, she didn’t read the directions and roasted the breast in the toaster oven until the skin was golden brown, at which time I pointed out the recipe instructions. We both agreed it might still make good soup, so I removed the main breast muscle and skin from the bone and tender muscle, added everything to the pot, and proceeded with the recipe directions from there. 1. Roast breasts until the skin is nicely browned, cool it enough to handle, pull off main breast muscle, and add everything to the soup pot including any juices in the roasting pan. 2. Add the water, a little salt, bring to boil, and simmer about 25 minutes. 3. Remove chicken from broth, and set aside to cool enough to handle then debone and dice meat to desired size - discard skin and bones. 4. Strain broth and remove most of the fat. 5. Add broth back to pan, dissolved bouillon cubes (if using), and salt and pepper to taste. 6. Add vegetables and cook until done. 7. Meanwhile cook egg noodles al dente in another pan, salted to taste. 8. Drain noodles and add to the soup. 9. Stir all together and serve. For her pasta, Riley chose a mix of spaghetti and dots and I followed the package directions for cooking beginning with the spaghetti, which I forgot to break into shorter pieces – making it a little harder to eat. The picture doesn't do it justice - Bev added some roasted jalapeno to her bowl. What a fine mistake it was to roast the chicken as it gave the soup a rich, full bodied flavor and this will be the new standard from now on. Even though it had been cooked twice, the chicken was moist and tender – I used about a ½” dice. If you have a favorite chicken soup recipe, that doesn’t include roasting the chicken, you may want to give it a try. Sorry for the lack of photos but I wasn’t planning a blog post about this until I tasted it. After the chicken soup, Reese and Riley decided a bubble bath was in order - no posing, they just looked this way. With all of the great looking fried chicken posts I’ve read lately, I’m almost embarrassed to post this, but only almost. 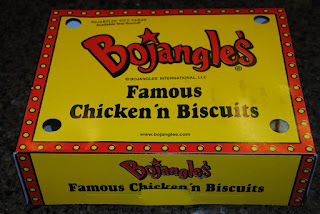 I actually like Bojangles chicken and I love their biscuits, even as leftovers, which we had after Bev and Madison brought home a box full the other night. Bev had fixed a similar breakfast the previous day, but I wanted to do a couple of things differently, such as using my favorite part - the deep fried, crispy skin. Bev omitted the skin, but I removed and chopped it then fried it a little to render some of the fat and re-crisp it. The other change was to add eggs, but not my normal and easy fried eggs or even poached eggs, but rather the perfect soft boiled eggs as defined by Pam at For The Love Of Cooking. I’ve cooked many soft boiled eggs in my life, but never paid enough attention to the detail to get the doneness just right every time, but the biggest difference is opening it. Just like my mom, after cooking, the egg was held over the dish, cracked with the side of a spoon, split in half and the white scooped out of each half - the yolk ran out. Pam, on the other hand, peels hers, being careful not to puncture the white and thereby making a much prettier egg. Check Pam’s site for specific directions and her beautiful presentation. But I’ve digressed so back to this meal. In addition to chopping the skin, I diced the meat and warmed it in the microwave along with the biscuit which was split and topped with a piece of cheddar cheese – while the eggs were cooled and peeled. This what I ended up with. As it turned out, the night before, Madison ate the chicken for a late supper. Like the above, I often write up my food posts in advance as a guide to cooking the meal and this time it didn't quite work out - the silver lining was that Madison ate well - but I wish she'd at least left me the skin. Oh well, I'm sure it would have been very good and it will be on the menu the next time but I'll secure a piece of chicken, as our fridge policy is first-come-first-serve unless it's labeled. Fried Green Tomatoes - Since I've been eating fried green tomatoes as far back in life as I can remember, I was a little surprised by the number of commentors who had not eaten them. I can imagine their flavor isn't for everyone, but I would encourage anyone to order up a few in a restaurant just in case they might be missing out. 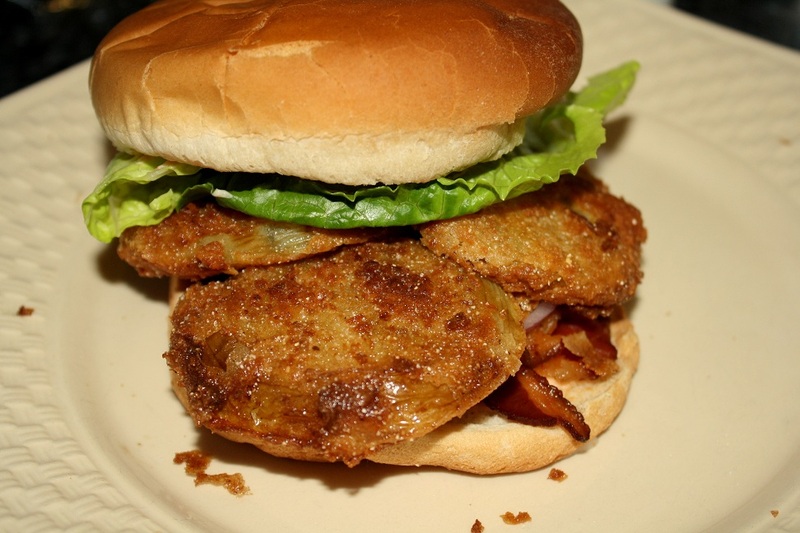 We’d bought a few green tomatoes a couple of weeks ago and decided to turn them into a green tomato BLT using a recipe I found on line. The recipe called for a buttermilk/egg dunk then into seasoned breading. Earlier in the day I had fried up a bunch of Benton’s bacon for this meal and for our Independence Day cookout. Bev made a sauce by adding some ricotta cheese (for thickness), garlic hot sauce, and chili sauce to ranch dressing. I set up the breading station on the grill hood, fried the tomatoes in canola oil, and drained on paper towels. While I cooked the maters, Bev got everything else ready for the sandwich composed of a large bun, the doctored ranch dressing, a little thin sliced red onion, lettuce, and then the green tomatoes. I thought the sandwich was plenty good but not blow me away and after eating a fried tomato by itself, I was disappointed for two reasons. First the tomato wasn’t tangy enough which is likely due to the time in the fridge and beginning to ripen just a little – the ones growing in my garden will resolve that. The second was the seasoning on the tomato, as it just wasn’t enough and never is when I season the breading. So I need to find a better way such as seasoning the egg wash or seasoning the tomato after the egg wash. The positive for the breading – the combination of flour, cornmeal, and Panko was tasty and had a nice crispiness. Do you have a seasoning/breading method that works well for you? I imagine several folks read this title and said “no need for me to read that,” and my wife would be one of them. 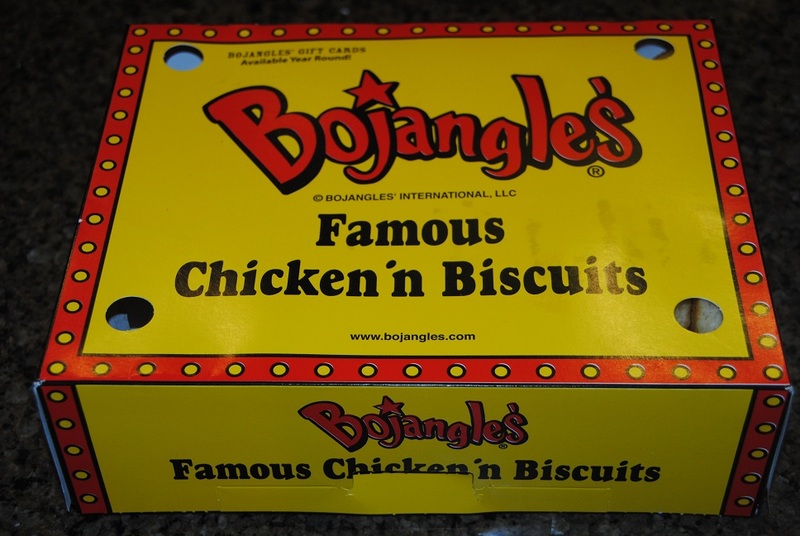 I totally understand that for some, only breakfast food will work in the morning. Growing up, fish for breakfast was the normal on family fishing trips and to this day I can eat any type of food for any meal at any time of the day – leftover pizza is a breakfast favorite. We had one piece of fish left from our catfish supper and I decided to turn it in to breakfast along with a couple of sunny side up dippy eggs and a piece of toast for the dipping. The catfish was seasoned with nothing but salt and pepper and coated with white corn meal – my preferred yellow was in the freezer – and pan fried in canola oil. The eggs were cooked in canola oil with a little water and a lid on the pan. Definitely good eats and I was plenty full – I didn’t remember the piece of fish being so large. After getting our coach back from the dealer with all but one warranty issue completed, we made another shakedown trip to the North Georgia Mountains (we enjoyed last years visit) and ended up with an RV full. Our normal four of Bev, Madison, Pat, and I were joined by Madison’s sisters Reese and Riley. 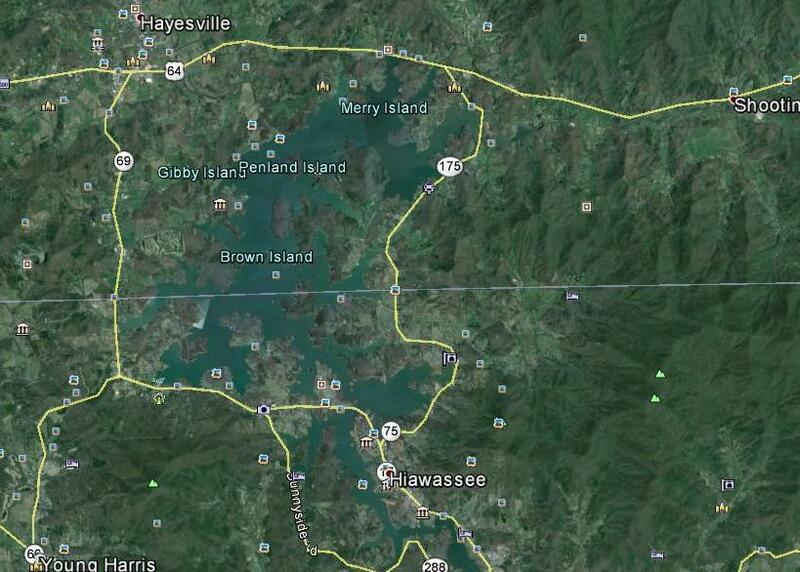 With Sweetie (dog) as my co-pilot, I drove the coach down to Hiawassee GA, while the girls drove over to Spartanberg, SC to meet Rhett (son) and pick up Reese and Riley – first time I’d driven that far (100 mi.) without Bev as the co-pilot so hopefully she’ll relax a little now. The drive to Hiawassee took us up the Ocoee River Gorge, site of kayaking for the 1996 Atlanta Olympics, and it was full of rafters and kayakers and the narrow, curvy road was crowded with cars and rafting buses - note to self, avoid weekends on that road. There had to have been 100+ rafters waiting to go at the launching point just below Ocoee #2 Dam. They can only raft on certain days as TVA runs the water down a flume to the powerhouse during the the others yielding a dry riverbed - in other words, they turn the river on and off. As I got to Hiawassee, I began passing the some of the many fingers of Chatuge Lake which was also loaded with Saturday boaters. 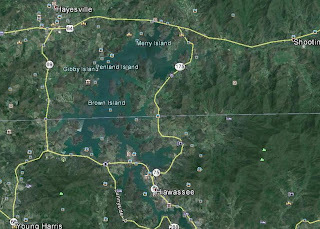 Chatuge Lake is the first of three dams built by TVA on the Hiawassee River, and it straddles the GA/NC line – with its many fingers, I can see it being very easy to get lost on – unfortunately co-pilot Sweetie didn’t get photos of any of this but here's a shot from Google Earth. We stayed at the Riverbend Campground, just south of Hiawassee and had a nice, large site on the banks of the Hiawassee River. 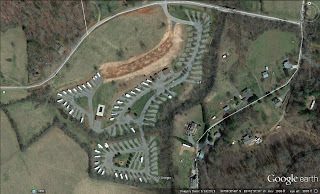 The campground is upstream from Chatuga Lake and while it has only gravel roads and sites, there is plenty of room between sites and the landscaping is very nice as seen from Google Earth and some ground shots. 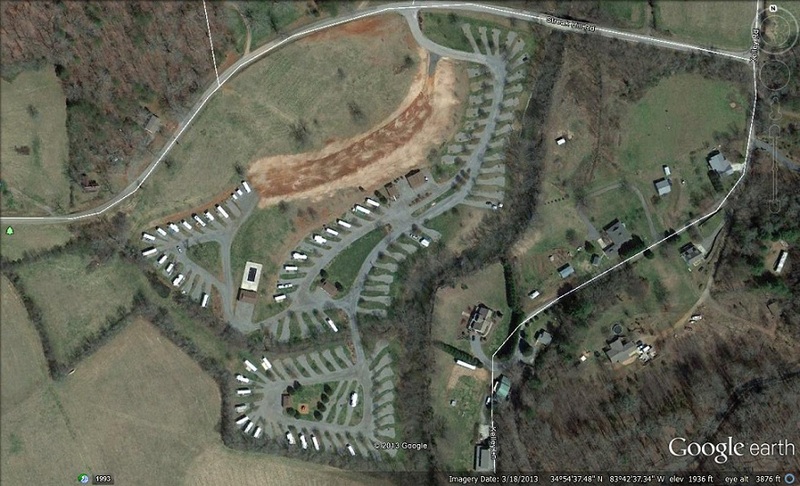 This is our spot and as can be seen, there is plenty of grassy area between campsites. They can accommodate everything from tents to the longest rigs in their three very large pull through sites. The office/store and bathhouses were clean and well maintained and it is obviously a family campground as it offers plenty of playing space and a nice playground - lots of kids there on the weekend. It is obviously a place associated with weekends on the lake as it was nearly vacant during the week even though many of the rented-long-term spots still had the RV's on them. It also must be a good place to learn to drive as the kids continually rode around in golf carts. I selected Riverbend after narrowing the choices to three from the list on RVParking.com, based on one camper review, and after driving thru the other two (Bald Mountain and the Fairgrounds), I'm convinced I stumbled into the right choice. While not a high end RV resort, it was a very nice $34 night campground and we would definitely stay there again, but would be sure we had something to deal with the pesky flies outside as they were beyond plentiful. As is usually the case with squash, this year were having difficulty finding a home for all of our cucumbers – I over planted and they are doing great. We still have dill pickles from last year and I asked Bev if she’d like some bread and butter pickles to which she gave a half-hearted okay. When I was a kid, I was fed them a lot, but always preferred the onions to the cucumbers and rather than love them, they are definitely not my favorite – I’m a garlicky dill kinda man. I went looking for recipes and settled on one from food.com in part because it was described as “... grandmothers recipe” by the recipe writer but mostly because it had the lowest sugar to vinegar ratio I found. I’m thinking if they are less sweet, I might enjoy them. The recipe was from cuisinebymae on September 12, 2003 and I followed the it as written. 1. Combine cucumbers, onions, salt and ice in a large bowl and mix well. 2. Put a weight on and allow to stand 3 hours. (For a weight, I use a plate with a gallon bottle of vinegar or water on top of it). 4. Combine vinegar, sugar, turmeric, celery seed, and mustard seed in a large pot. 5. 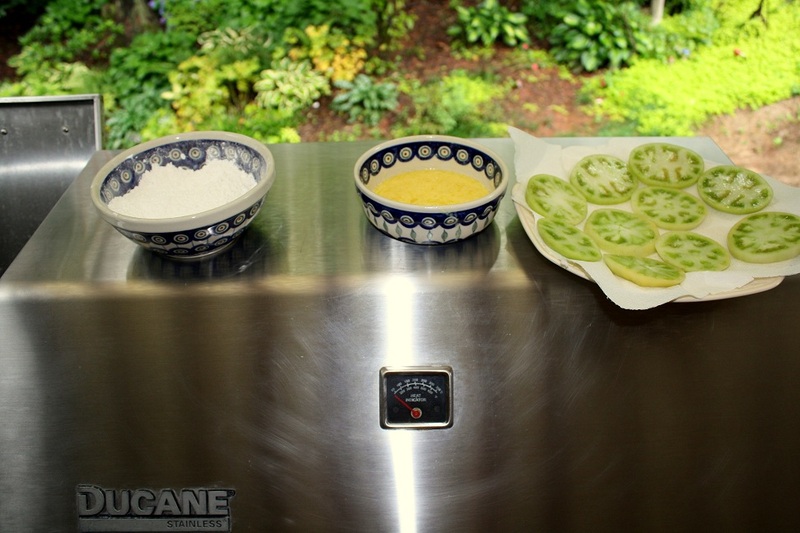 Add drained cucumbers and place pot on medium low heat. 6. Bring almost to a boil, but DO NOT ALLOW TO BOIL. Bev tried some when they'd cooled to room temperature and said she absolutely loved them - unlike the days required for dills, these begin to taste pickled after just a few hours. 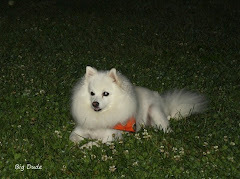 Then, rather than the half-hearted okay, she enthusiastically wanted to make some more as soon as we had enough cukes. We both liked the yellow color given to the white skinned cukes by the turmeric and mustard seeds. 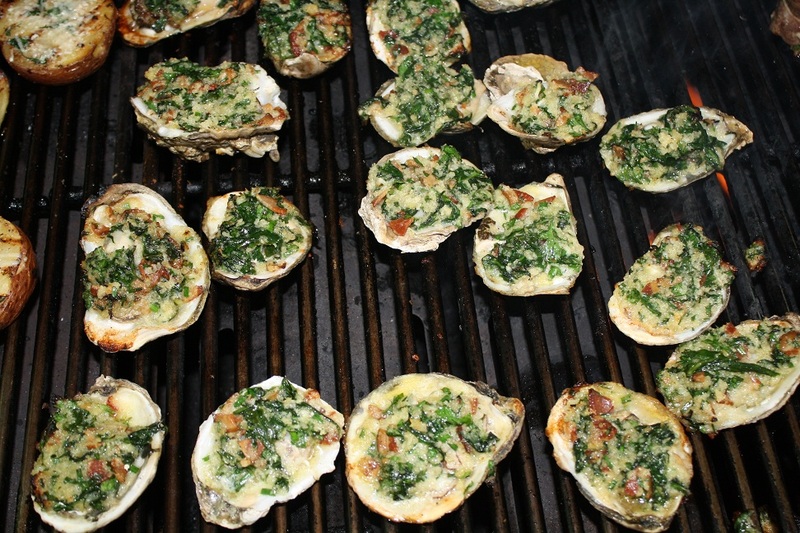 Bev wanted some Oysters Rockefeller and I’m only too happy to help make it happen, as we both love them. 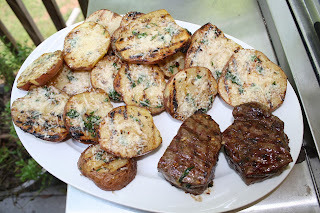 As it turned out we also had a prime strip steak in the fridge left from a recent meal and we added some grilled potatoes, which are also a major favorite of Bev’s. I washed the oysters mid-afternoon and shucked and ate the little ones along with a little cocktail sauce and lemon – cooks treat you know (shucked the others just before using). 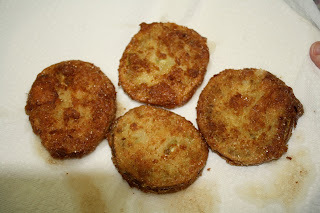 The potatoes got washed, a skin cut taken off each side, then cut into half-inch slices and par boiled to almost done. Then, the top side was brushed with canola oil and seasoned with Sint Maarten Jerk Seasoning. After putting them on the grill, I repeated for the top side and after flipping, I brushed with melted parsley butter and added grated parmesan. The steak sat on the counter for a couple of hours and per Chris at Nibble Me This, I cut it in half, tied with a string to create Manhatten Filets, and seasoned with the jerk seasoning, yep you heard right. I can count on one hand the number of times I’ve cooked prime beef. The oysters got our normal oysters Rockefeller treatment. The potatoes (med heat) and steak (high heat) went on at the same time and when the potatoes were done I moved them over to indirect heat to keep warm. 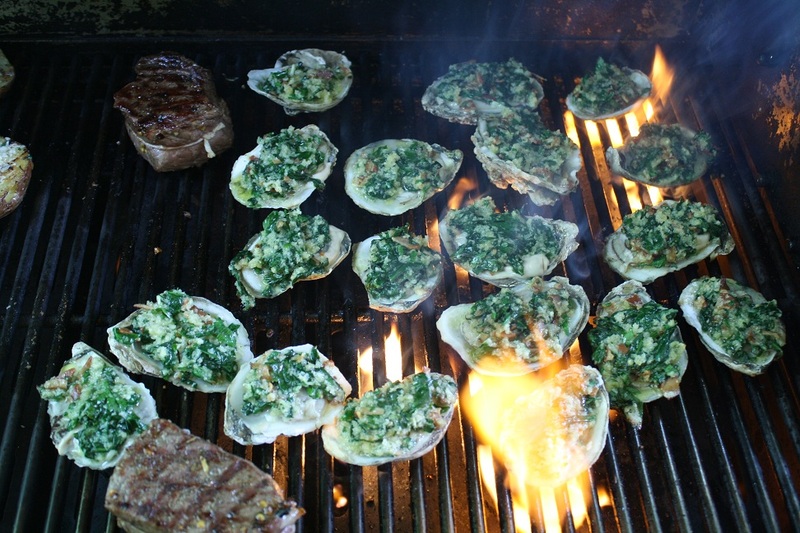 After the steaks were flipped I cranked the running burners up to high, added the oysters and closed the lid to get some flaming going on. As the oysters started to bubble, I moved them to the lower heat at the front of the grill. The steaks came off at 127* and rested for a few minutes before cutting. 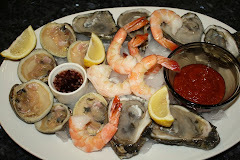 This is my plate, but I went back for more oysters - they're mostly just shell you know. 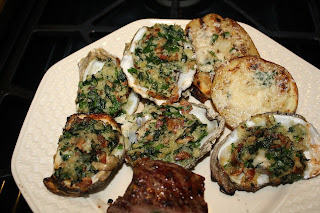 Everything was delicious and the only things I’d do different is use more spice on the potatoes and not let the steak get too done while fooling with the oysters. We've now used the Jerk Seasoning several times and, surprisingly, have liked it on everything so far. We hadn’t made this dish for a while and Bev wanted to have it for company recently, so we dug out the recipe. 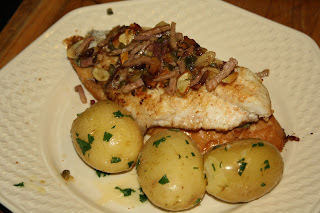 I had blogged about it back in Dec, 2009 using Crappie and when I did a web search for this post to see where I originally got the recipe, I found it several places, so it must be fairly popular – still don’t know where it came from though. The recipe makes 4 servings with a prep time of 20-30 minutes and a cooking time of 15 minutes. 1. In a small bowl mix olives, mustard, and 1 ½ tsp olive oil. Set aside. 2. Heat oven to 250 F.
3. In a small bowl, stir together 2 tsp olive oil, hot sauce, and lemon juice. Brush on both sides of fish. Heat a non-stick skillet over medium high heat and add fish fillets, two at a time. Cook about 5 minutes per side, or until brown, turning only once. Transfer to an oven-proof dish and keep warm in oven. Repeat with remaining fish fillets. 4. Over medium heat, melt butter in same skillet (fish drippings remain in skillet). When lightly brown, add prosciutto and saute for a couple of minutes – be sure to mix in all pan drippings. Remove from heat and stir in capers and almonds. 5. Just before serving, toast French bread and spread with black olive mixture. Place a piece of toast on each plate, top with catfish , and spoon over prosciutto-butter sauce. We sided it with some parsley potatoes and it was as good as I remember and everyone seemed to agree - a company meal for sure. Our original plan, to celebrate America’s Birthday on the dock, got changed due to rain and I was happy to move to the house considering an alternative now being experienced in the American West. We decided on a very traditional meal of burgers, beans, and potato salad and, as usual, I went to your blogs for our meal recipes and had two that were recently posted. For the beans, I used the recipe posted by Mary at Deep South Dish for Baked Bean Medley except I used her crockpot instructions rather than heat up the house with the oven. 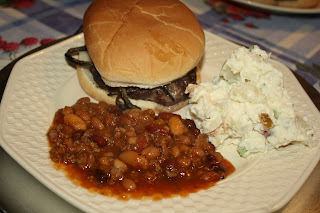 I followed her recipe as written so just click on the link to view it - in addition to the Bush's Baked Beans, we used the canned beans we had on hand: kidney, black, cannellini. When Chris at Nibble Me This posted his recipe for Pimento Cheese Burgers, it really spoke to me – I love homemade pimento cheese. 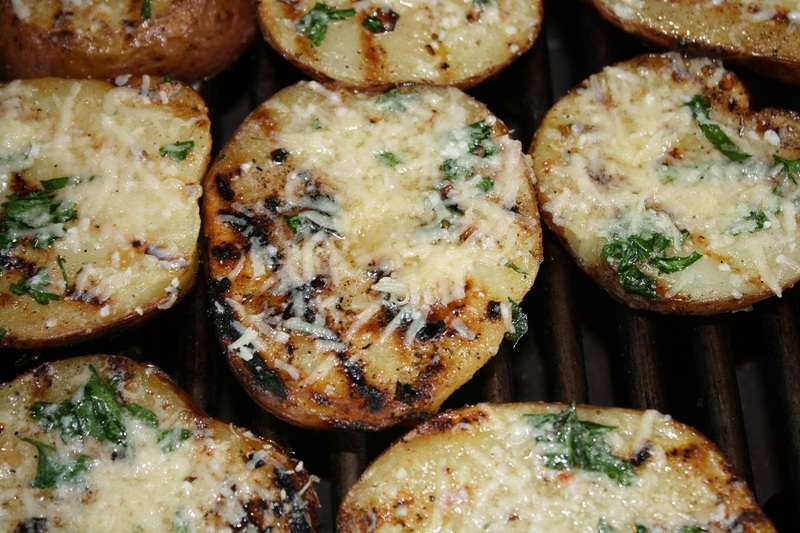 Please click on the link for the recipe, which we followed as written, except we used all cheddar cheese. For the burgers, I adapted Chris' recipe for the ingredients we had on hand, added one, and up sized for our crowd. Mix all ingredients and shape into eight half pound burgers (it was a celebration you know). As usual, I got the burgers about one level more done than requested. I need to use the charcoal grill with it's hotter fire to be able to get an outside crust quick enough to not cook the inside as much then move to indirect to finish cooking. Rounding out the meal was delicious potato salad provided by our guests. Check Chris' site for a good burger shot. We also had some chips with queso and guacamole dips, several adult beverages, and peach cobbler with ice cream for dessert. The cobbler, made with a recipe from Allrecipes, seemed to be a big hit. As expected, I thought everything was very good and thank Chris and Mary for their fine recipes and Bonnie for the potato salad. Good food and good company made for a fine way to spend our Independence Day. 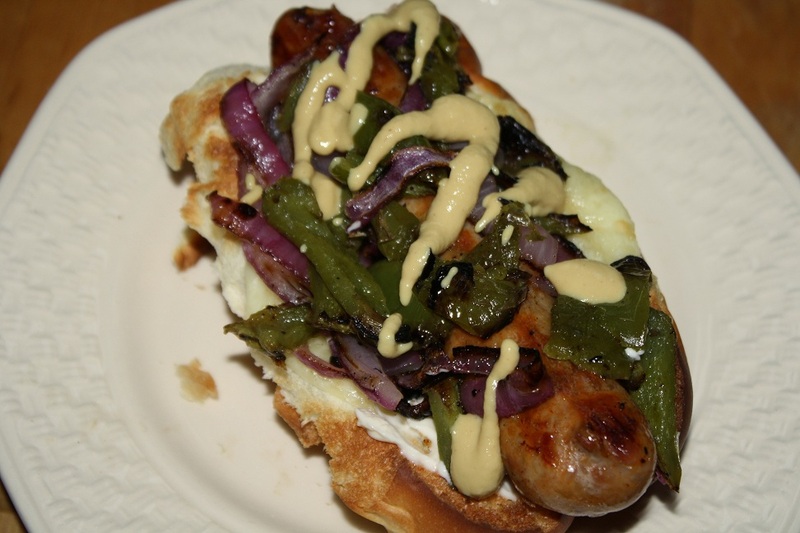 Perhaps we should have offered a Publix Italian sausage dog as a burger alternative - it was awesome a few days earlier.